Well, for us fans of The Walking Dead, it might come as a surprise to learn that the mid-season debut stomped the Winter Olympics among the 18-49 demographic. TV's reigning ratings champ kicked off its midseason run on Sunday night, facing an unfamiliar foe: the Olympics. For the first time in its four-season run, AMC's The Walking Dead went head-to-head against the games and it lost no steam facing the stiff competition. 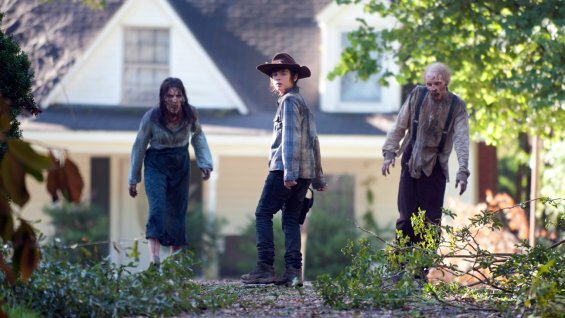 AMC saw the midseason premiere of The Walking Dead deliver whopping 15.8 million viewers. That comes in just a hair shy of the fall's record 16.1 million viewers. And while it may not have outperformed the Olympics in total viewers, it did win the night among adults 18-49. The Walking Dead matched its previous series high with 10.4 million in the key demo. That amounts to a 8.3 rating in the targeted demo. The Olympics have a 6.9 rating ahead of final returns.